Animal welfare charities are bracing themselves for a flood of abandoned animals as increasing numbers of owners dump unwanted cats and dogs in the face of growing economic recession. ASH Animal Rescue reports that they have already experienced a marked increase in the number of homeless animals brought to their centre in Kiltegan, Co. Wicklow. “So far this year we have rescued an average of 30 cats and kittens and 50 puppies and dogs per month, as a result which we are now at full capacity.” says Remi le Mahieu of ASH. A subsidised spay and neuter scheme operated by Irish vets with the support of an international dog welfare charity is set to make a positive impact on the huge toll of unwanted dogs that are destroyed in the country’s pounds every year. Since it was launched by Dogs Trust in mid-2006, over 26, 000 dogs have been spayed or neutered under the scheme, which with funding from the charity is now available in 360 veterinary clinics nationwide. 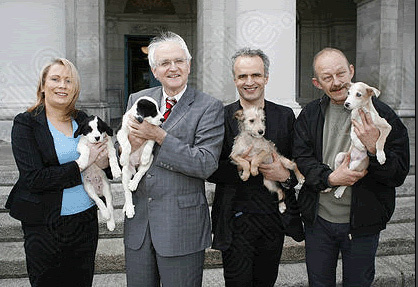 (l to r) Brenda Comerford, Dogs Trust Campaigns Manager Ireland, Minister John Gormley, Vet Pete Wedderburn and Remi Le Mahieu from ASH Rescue (who provided the puppies). Newstalk 106 presenter Claire Byrne got together with some furry special friends today (Wednesday 21/05/07) to highlight Ireland’s shocking addiction to destroying unwanted cats and dogs. Most recent figures from the Department of the Environment show that 14, 598 unwanted dogs were destroyed in Irish dog pounds in 2006, representing a daily destruction rate of 40 dogs for every single day of the year.